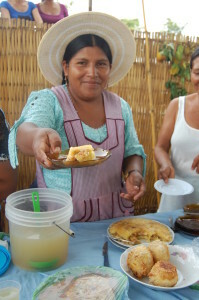 Lack of access to food is the main cause of food insecurity in Bolivia. Rural and indigenous communities depend heavily on subsistence agriculture, and people often experience food shortages due to frequent natural disasters and sudden changes in food prices. These factors affect the nutrition of children, causing serious and chronic malnutrition. Due to the lush rainforest geography and climate, many non-indigenous peoples have migrated to the Alto Beni region of Bolivia to work in the logging industry and in banana and citrus fruit plantations. Resources are being over-exploited for export and the rainforest ecosystem is being compromised. In an effort to protect indigenous lands while responding to the high rates of poverty and malnourishment, Moseten Indigenous Women have employed sustainable agriculture practices to successfully harvest and process food to provide nutritious, locally-grown food for the Government’s school breakfast program. is a common one. 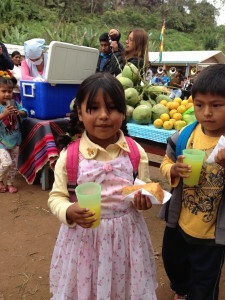 Parents of school children in Alto Beni, Bolivia all remember having a school breakfast program in place when they attended schools and all testify to its capacity to increase school performance amongst the students. Since the federal government passed its National Development Plan in 2007, highlighting the responsibilities of municipalities to take on this program, local citizens have been pressuring their municipal governments to fulfill their obligations to local school children. Through collective organizing, investment in agriculture and support for small-scale farmers and sustainable farming practices, these small farmers are improving food security in their own communities. Change for Children’s program, Better Nutrition, Better Learning, combines training in agriculture and enterprise development to help women produce more food (improved food security), create nutritious & marketable food products and then sell them to the school feeding program (improved income security) ensuring children are well nourished (improved child health) and thus able to learn (improved education). Change for Children supports sustainable community development in Latin America, Africa and the Caribbean. It is through partnerships with community groups and individuals who are advocating for southern communities, that we stimulate positive, long-term social change. In solidarity with southern partners who are committed to pursuing sustainable solutions, Change for Children is committed to understanding what our role is, as Canadians, in the struggle to alleviate global poverty. Change for Children does not have offices in the developing world; instead, we support and empower local organizations who apply local knowledge and skills to solve problems and improve their communities. It is in this way that sustainable solutions are developed. Our Partners: Fundacion Renace is Bolivian-based social and environmental NGO with a 6-year history working with indigenous and rural campesino communities on sustainable agriculture projects. The Moseten Indigenous Women’s Group has been organizing in their communities for many decades, providing social and emotional support to women, and encouraging participation in community decision making.